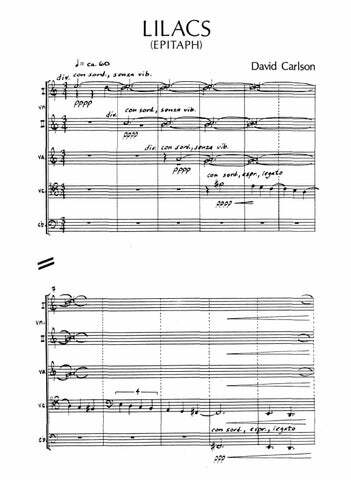 Born on March 13, 1952 in Ventura, California, David Carlson has composed successfully in many genres including orchestral music, chamber music and opera. His works have been performed by some of the country’s leading orchestras and chamber ensembles. The recipient of a number of awards and honors, he has received grants from Meet the Composer and commissions from Chamber Music America, the a cappella vocal group Chanticleer and opera companies in New York, Utah, California, Missouri and Florida. In 1995 he was given an Academy Award in composition by the American Academy of Arts and Letters. He has recently been commissioned to compose a large orchestral work for the ambitious Magnum Opus project, and Anna Karenina, a large-scale, full-length opera – his fourth – commissioned to a libretto by Colin Graham to celebrate the opening of the new Miami Opera House, debuted there in April, 2007, and had a second run of performances by co-commissioner Opera Theatre of St. Louis, in June of 2007. Carlson’s operas have received international acclaim and numerous performances. The Midnight Angel, with a libretto by Peter S. Beagle, received its premiere in 1993 by the Opera Theatre of St. Louis. It was subsequently staged by Glimmerglass Opera and the Sacramento Opera, who, along with Opera Theatre of St. Louis, had co-commissioned it. In the fall of 2007, The Skylight in Milwaukee, Wisconsin presented a run of ten performance of The Midnight Angel, in a reduced orchestration for 21 players. Carlson’s next opera, Dreamkeepers, commissioned by the Utah Opera in 1996 in celebration of the state’s centennial, is a story about the Ute Indians, with a libretto by Aden Ross. It premiered in 1996 and was revised in 1998 for a production by the Tulsa Opera. Dreamkeepers was featured at the International Theater Institute’s 1998 conference in Germany, the only opera chosen to represent the United States. Carlson has adapted material from Dreamkeepers into two orchestral works, Symphonic Sequences and Bear Dance on Ute Indian Rhythms. Bear Dance was tremendously successful in a series of children’s concert performances conducted by Emil de Cou with the San Francisco Symphony and the National Symphony, as well as in a performance by the Boston University Orchestra at Tanglewood, conducted by Leif Bjaland. 5:00 3(Picc.) 2 2 2 – 4 3 3 1; Timp. 3Perc. Cel. Hp. Str. 30:00 Picc.(dbl. Fl., Alto Fl. ), 2 2(dbl.E.H.) 2 2(dbl. Cbsn.) – 4 3 3 1; Timp. (2) 4Perc. Pno.(dbl.Cel.) Hp. Str. 7:00 1 1 1 1 – 2 2 1 1; Perc. Cel. Hp. Str. 14:00 2(Picc.) 1 1 1 – 3 1 1 0; Timp. Perc. Pno.(Cel.) Hp. Str. 7:00 3(Picc.) 2 3 3(Cbsn.) – 4 3 3 1; Timp. 4Perc. Cel. Hp. Str. 20:00 Solo Vcl. ; 2(dbl. Picc.) 2(dbl.E.H.) 2(dbl.E-flat Cl.) 2(dbl.Cbsn.) – 3 0 0 0; Timp. 3Perc. Cel. (prepared pno.) Hp. Str. 25:00 Solo Vln. ; 2(dbl. A.Fl.) 2 2 2(dbl.Cbsn.) – 2 2 0 0; Timp. 2Perc. Cel. Hp. Str. 22:00 Saxophone quartet: sop.sax., a.sax., t.sax., bar.sax. 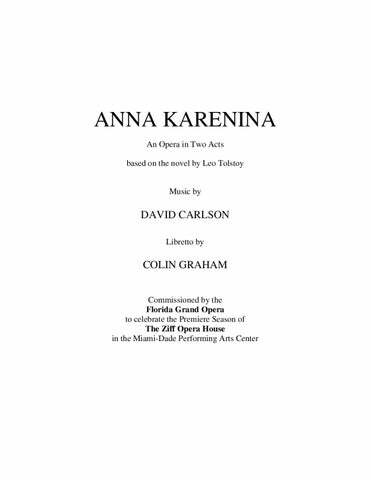 An Opera in Two Acts, after the Novel by Leo Tolstoy 2:55:00 Solos; 2 sop., 3 Mezzo-sop.,contralto, 2 tenors, 2 baritones, bass.baritone, 5 speaking roles; 3(Picc.) 2(dbl. E.H.) 2 2 – 4 3 3 1; Timp. 3Perc. Cel. Hp. Synth. Recorded sounds; Str. An opera in two acts 1:40:00 2 1(dbl. E.H.) 1(dbl.B.Cl.) 1 – 2 0 0 0; Perc. Hp. Kybd. ; 2Vl.1A, 2Vl.1B, Vl.2A, Vl.2B, Vla., 2Vcl., Cb. 12:00 SATB soloists, SATB chorus; hp., vn. (4), va.(2), vc. (2), db. 20:00 SATB chorus; 3(Picc.) 2(dbl. E.H.) 2 2 – 4 2 2 1; Timp. 2Perc. Cel. Hp. Str.